BlackBerry continues to reshape itself as a software and services business with the launch of what it calls an “Enterprise of Things” platform, aimed at providing a mobile-native approach to endpoint security. The new platform is cloud enabled and is aimed at addressing the entire enterprise from endpoint to endpoint, according to the Canadian tech company. BlackBerry defines the “Enterprise of Things” as the network of intelligent connections and endpoints within the enterprise that enable products to move from sketch to scale. The company thinks of the concept as a collection of devices, computers, sensors, trackers, equipment, and other "things" that communicate with each other to enable smart product development, distribution, marketing, and sales. The new offering is intended to help drive BlackBerry’s ongoing move to software, and represents the completed integration of some of its key technology acquisitions, including Good Technology, WatchDox, AtHoc, and Encription. The company, best known for its smartphones, has spent several years working to reinvent itself after its smartphone sales slowly languished following the introduction of Apple’s iPhone line and Google Android devices into the market. BlackBerry now refers to itself as a mobile-native security software and services company. 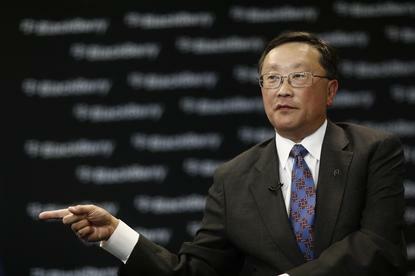 For BlackBerry executive chairman and CEO, John Chen, the new BlackBerry is now in a position to address new challenges faced by businesses with its enterprise security technology. "Businesses must be able to confidentially and reliably transmit sensitive data between endpoints to keep people, information and goods safe," said Chen. "BlackBerry is uniquely qualified to address this emerging market now because of our deep experience, industry leadership and ongoing product innovation that addresses future business needs," he said. The new solution, in its entirety, is called BlackBerry Secure, with Chen saying that it lets customers build their own apps, workflows, and business processes. “[It] will be compatible with future applications and cloud-based systems, because we have plans to expand the platform's features, market segments it supports, and our entire partner ecosystem,” he said.